Mike St. Clair Of VIPER PARANORMAL Explains It All ...And He Does It Very, Very Well! Mike St. Clair Of Viper Paranormal shows you some very important steps in starting your own "Ghost hunting" group or learning how to set up a team and what equipment is necessary. And he is fast becoming a Very important person in the field of Paranormal Investigations to keep your eyes on! Mike St. Clair is the co-founder and lead investigator for Virginia Investigators of Paranormal Education and Research. Viper Paranormal Website: www.viperparanormal.com Here you will find many serious and well put together tutorials, budget ghost hunting and research videos. He is fast becoming one of the most notable and well respected new comers to field of Paranormal research to day. St. Clair as he tells has been more then just fascinated with the paranormal for as long as he can remember and began his own paranormal journey in 2008 co-founding Viper Paranormal with good friend James Burnette. St. Clair also hosts VIPER PARANORMAL screamfreak79's Channel on youtube http://www.youtube.com/user/screamfreak79, his well put together videos brings to light many details and insights into basic and advanced ghost hunting information and techniques to the delight of new students and well salted investigators in the paranormal field. With his direct approach he exposes many myths as well as explains in a well executed manner his beliefs and personal insights into paranormal studies concerning ghosts, paranormal equipment and it use, and how to get to the nitty gritty and understand what your personally experiencing and collecting in your evidence. Budget Ghost Hunting tips "Hands free voice recorder " is a must see example of St. Clair's personal strides in these trying financial times that you don't need a lot of many to have the latest greatest equipment to start investigating. The videos he presents have great value to many and some noted ones you need to check out are "How to make a free white noise generator for EVP.Tutorial." And what many call his best How to avoid being SCAMMED and ripped off by online Ghost Hunting Stores & what not to buy. In this budget ghost hunting tutorial St. Clair shows you how to avoid being scammed and ripped off by buying useless and overpriced equipment from online ghost hunting stores. These stores are targeting beginning investigators that don't realize they are being ripped off. Never again get tricked into paying outrageous prices for stuff you don't need. This is an experiment using only consonant and vowel sounds as raw audio. EMF detector for under 10 bucks. Please contact us if you believe you are experiencing any supernatural activity or have any questions related to the field. We will try to answer any questions you may have. If we don't know the answer we will point you to someone who does. All of our services are FREE and CONFIDENTIAL. If you want to learn how to start your own paranormal investigation group make sure to check out our "Budget Ghost Hunting" tips and tutorials in the video section of our website. Don't forget to sign our guestbook and leave a comment. Viper Paranormal is happy to announce that we have teamed up with Roanoke's Investigation of the Paranormal. You can access their page by clicking the photo below. Virginia Investigators of Paranormal Education and Research. Are as their website states an educated group of Christian researchers dedicated to using scientific tools and methods to accurately determine whether you are experiencing paranormal activity or natural phenomenon. Viper Paranormal is based in the Roanoke valley and serves all of Virginia. All of thier helpful services are free and confidential. Many who turned me on to his wonderful youtubes have releated to me that St. Clair has a wonderful flair for being concise, articulate and direct. And his to the point presentations or a well cherished video catalog of many new students of paranormal investigation. His STOP PARANORMAL FRAUDS!!!!!!! video has as many believe help to raise the bar and set straigt the ongoing debates over whatis real and what is not. In this video St. Clair talks directly and seriously about fraud in the Paranormal field. "These people have to be stopped. He states with commitment. convition and a deep honest and believable sincerity. "I quickly realized investigation was different than what you normally see on television shows." States St. Clair "This made my thirst for knowledge increase as well as my dedication to the paranormal field." "I am a true believer, but I also believe there are dishonest individuals and paranormally uneducated groups misanalysis or altering their evidence." "Our team researches, investigates, and learns as much as we can from as many resources as we can find." "We share our knowledge in easy to follow videos and we learn something new everyday." "You should too." 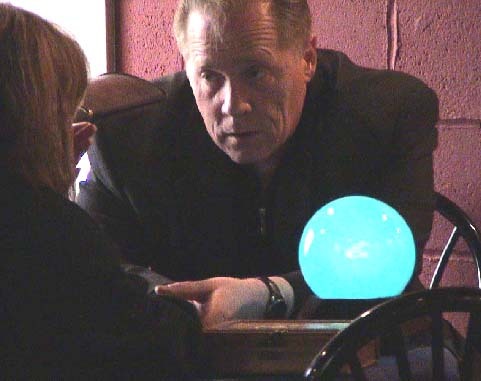 St. Clair stated that "VIPER Paranormal would not be the strong team it is today without honesty, dedication, teamwork, and educated investigators with their own unique skills and approach to paranormal investigation." "None of this would be possible without Co-founder, James Burnette, and Investigators, Sam Joseph and Cyndi St. Clair."